Plumeless thistle is a herbaceous biennial. Flowering plants can range from 1-7' tall. Stems are spiny winged. 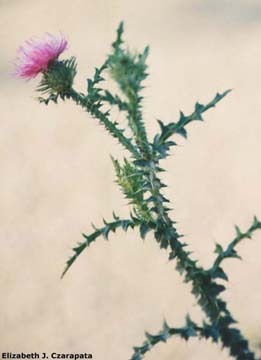 Plumeless and musk thistles will hybridize. Leaves: First year basal rosette leaves can be 20" long. Stem leaves are alternate and coarsely lobed. Lobe tips have stout spines. Leaves are smooth above and hairy below. Flowers: Flower heads are brush like and are pink to purple. There can be on or a cluster of flower heads at the end of the stem. Flower heads are .5" to 2" across, and are on winged stems; bracts with spiny tips. Blooms in May-August. Fruits & Seeds: Seeds have a tuft of feathery bristles and are dispersed in the wind. Roots: Has a taproot system. Plumeless thistle will invade prairies, fields, pastures, roadsides, and ditches.